The pair – which, presumably now constitutes a 1,600-pound ape – are forming a ¥300 million joint venture company to promote the use of DoCoMo’s IC-card based e-cash phones in McDonald’s outlets. For once, the press release is upfront about the purpose of the move, which is designed “…to plan and manage e-marketing promotions to McDonald’s newly planned membership club [and] … to strengthen customer loyalty”. 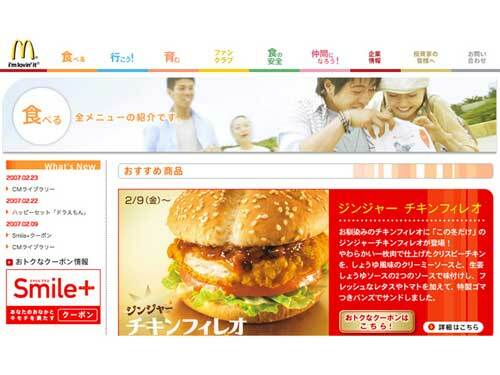 In other words, discount coupons, email offers and mobile-phone games, wallpapers and ringtones are on the cards for DoCoMo’s 52 million subscribers if they’re among the burger chain’s 1.4 billion annual customers. The DoCoMo technology that will be used most heavily is set to be the company’s ToruCa feature that will allow McD’s to push advertising to suitable phones via in-store terminals. Dining decisions made, customers are to get the rather novel option to pay for that Big Mac and fries using their phone-based iD credit cards.